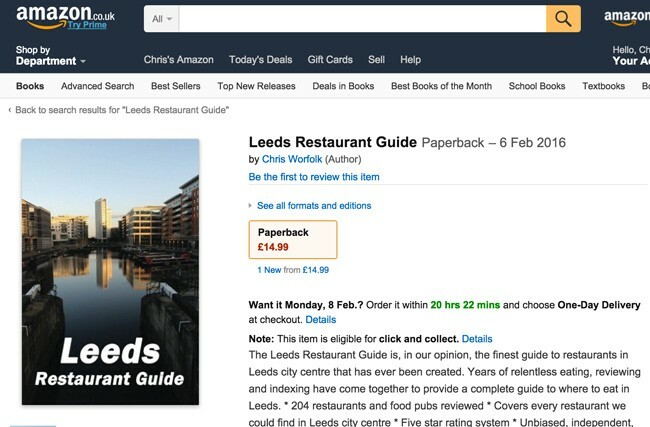 It has been two and a half years since we launched the Leeds Restaurant Guide. It originally came out as an eBook. This is a natural format for it. You can search it, index it and update it. It works great as an eBook. However, there is something magical about a physical book. Something that you cannot replicate with an electronic copy. I always wanted to do a print edition alongside it but the logistics of it were sizeable. One of the great things about the eBook edition is the speed we can put out updates. In its basic form, the guide is not a book: it’s a database. In fact, that is how we store all the information. I wrote a custom content management system to handle it all. This takes all the reviews in and spits out an eBook in a matter of minutes. If we wanted to publish a new edition, we could do within an hour. The print route is more difficult. Print books do not have the fluid content support that eBooks do. You have to design for a fixed layout, fudge pages and spend a huge amount of time getting it all right. Then if you want to make any changes, you have to re-done everything. Possibly the entire book. That would cause a huge time-lag and that just did not cut it for me. The guide evolves and the print edition needed to be able to evolve with it. Thankfully, after several failed attempts at getting the system correct, we finally have it in place. It is not quite as fast as the eBook, but gives us the ability to publish a new edition within 24 hours. This means that the print edition will not be a second-class citizen in comparison to the eBook. Initially, the book is available on Amazon. In the future: who knows where else!